We specialize in orthopedic, neurological, post surgical/functional rehabilitation, and pediatric therapy. Our staff has a varied background allowing us to address issues related to the spine, the extremities, post-operative rehabilitation, Parkinson's, vestibular, post stroke, and all aspects of pediatric care..
Our physical therapists emphasize one-on-one treatment to assist each patient according to the nature of their pain and specific injury. Click below for more information about our Orthopedic services. Our physical therapists work with children and their families to assist each child in reaching their maximum potential to function independently and to promote active participation in home, school, and community environments. Click below for more. 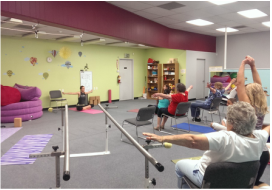 Our physical therapists work with head injuries, spinal cord injuries, balance and vestibular disorders, dizziness, fall prevention, Parkinson’s and other chronic or degenerative neurological disorders. Click below for more information about our Neuro and Vestibular Services.